Celebrating a transformational milestone in the 82-year history of its summer home, Tanglewood, the Boston Symphony Orchestra (BSO) announces the opening of the Linde Center for Music and Learning, a new four-building complex that will be home to the new Tanglewood Learning Institute (TLI). Offering participants an unprecedented and expansive array of more than 140 interactive and engaging cross-cultural activities and programs, the BSO’s ambitious new initiative will offer visitors a sense of discovery and engagement on a scale never before offered by the festival, which welcomes more than 300,000 visitors annually. Notable presenters will include Madeleine K. Albright, Secretary of State (1997–2001); Pulitzer Prize-winning historian and author Doris Kearns Goodwin; cellist Yo-Yo Ma; soprano Renée Fleming; BSO Music Director Andris Nelsons; composer John Williams; and playwright Tom Stoppard, among a long list of acclaimed artists and important cultural figures of our time. For details on all the Tanglewood Learning Institute programs, visit www.tli.org. 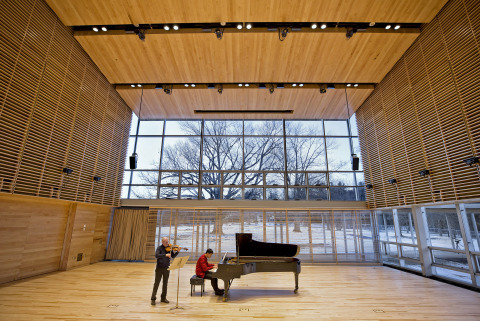 Opening on June 28, the new multiuse buildings of the Linde Center for Music and Learning will also provide concert and rehearsal space for the Tanglewood Music Center (TMC)—the BSO’s acclaimed summer music academy—and establish Tanglewood for the first time as a year-round facility. The Linde Center is designed by William Rawn Associates Architects and will be the largest building project at Tanglewood in 25 years, since the construction of award-winning Seiji Ozawa Hall (1994), also designed by William Rawn Associates. The first fundamental change in programming since Tanglewood was founded in 1937, and the Tanglewood Music Center (BSO’s acclaimed summer music academy) launched its first season in 1940, the new Tanglewood Learning Institute programming is a response to wider cultural shift towards learning and participatory activities that complement the concert experience. Designed for newcomers to Tanglewood and longtime festival patrons, Tanglewood Learning Institute programs will link Tanglewood performances to relevant themes from the worlds of visual arts, film, history, philosophy, and current events, exploring thought-provoking ways to better understand the world through the lens of music, as well as breaking down the traditional barrier between performer and listener. From the exploration of a new work for voices and orchestra inspired by the letters of celebrated artists Georgia O’Keeffe and her husband Alfred Stieglitz to an eight-day exploration with the Juilliard String Quartet and TMC faculty and Fellows, the Tanglewood Learning Institute represents a brand-new chapter in the life of Tanglewood. Among the new initiatives are Saturday morning Focal Point programs for amateur visual artists in the fields of painting, photography, and drawing; a Sunday evening Cinematics film series relating back to Tanglewood programming; TLI immersion weekends which take a deep dive into major musical themes of the summer; TLI OpenStudio offering an insider’s look at master classes led by today’s leading performers; Meet the Makers presenting a wide spectrum of creators sharing the inspiration behind their craft; and major cultural thinkers of our time featured in The Big Idea. Link to BSO press release for complete program details. “All of us at the BSO are thrilled to launch the Tanglewood Learning Institute and open a transformative new chapter of programming to enjoy alongside the great tradition of Tanglewood performances since 1937,” said BSO President and Chief Executive Officer Mark Volpe. Link to full message. Expanding to a year-round facility will further help “bring the world to Tanglewood, and Tanglewood to the world,” said Judith and Stewart Colton TLI Director Sue Elliott. “TLI’s many and varied year-round programs will engage diverse participants whose interests reflect their curiosity about the wider world, and who are eager to participate in meaningful, memorable experiences that help build a more civil society.” Link to full message. The complex boasts three technically advanced studios designed to maximize its flexibility for performance, rehearsal, and educational offerings of the Tanglewood Learning Institute. In addition, Cindy’s Café will be an informal place for musicians and audience members to interact—a hub for visitors, TMC Fellows and faculty, BSO players, and TLI participants. The buildings gather around a 100-year-old Red Oak, with a serpentine covered walkway connecting each building and framing views and paths through the landscape. As part of the overall major investment in Tanglewood, the BSO will also revitalize and strengthen Tanglewood's bucolic Berkshire 524-acre campus, with new plantings, pedestrian circulation improvements, and the restoration of views of the Stockbridge Bowl. The opening of the Linde Center complex and TLI programs, June 28–30, will include a special ribbon-cutting ceremony for the community, funders, builders, staff, and orchestra on Friday, June 28; and open houses with family-friendly activities free to the public on June 29, 30, and July 1. Tickets for TLI Programming and the 2019 Tanglewood season, which lasts through Labor Day weekend, will go on sale along with tickets for the entire 2019 Tanglewood season on February 10 at www.tanglewood.org and 888-266-1200. The BSO, one of the leading international orchestras, reaches over 1.2 million live listeners through its concert performances in Boston and Tanglewood and millions more via the internet, radio, television, education programs, recordings, and national and international tours. The BSO’s website, www.bso.org—receiving approximately 20 million visitors annually and generating over $134 million in revenue since its launch in 1996. One of the most popular and acclaimed music festivals in the world, Tanglewood—the Boston Symphony Orchestra’s summer home since 1937—is in the beautiful Berkshire Hills between Lenox and Stockbridge. Tanglewood is a driver of more than $103 million annually in economic impact in Berkshire County each summer. Link to study.